The eye-catching Skyrim Together mod is more than someone's pipe dream - it's a functional mod that currently lets up to eight players play together in Bethesda's hugely popular fantasy game. The mod is the work of a group of talented software engineers who have spent some time tinkering with Skyrim in order to get multiplayer working. The closed beta is for those who back the project on Patreon. The open beta launches immediately after the closed beta, which the modders said wouldn't last long in an announcement post on the Skyrim Together subreddit. 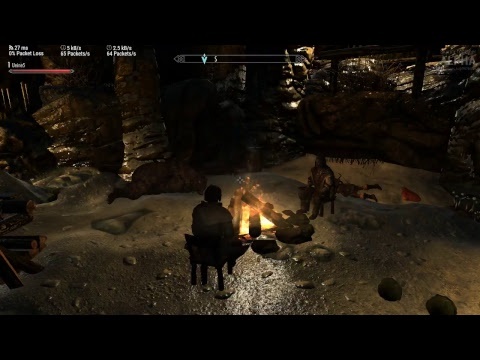 In the video, below, a group of four players explore Bruma, an area added to Skyrim as part of the popular Beyond Skyrim mod (Skyrim Together works with other Creation Kit mods). The mod appears to run smoothly and remains stable throughout. The user interface displays your co-op friends' health bars in the top-left corner of the screen. At one point, the group encounters an NPC who calls out for help as she's being attacked. You can heal friends with restoration spells, for example, and see when they level up. All times are GMT-5. This page was generated at 07:54:38 PM.